Engraver, draughtsman and painter Hendrick Goltzius was born in 1558 in Bracht-am-Niederrhein, Germany, into a family of artists. His great-grandfather Hubrecht Goltz von Hinsbeck and grandfather Jan Goltz I were both painters, and his father Jan Goltz II was a stained-glass painter in Duisburg. As a child Hendrick was injured in a fire, crippling his right hand – the one he would be working with. Aged sixteen he started an apprenticeship with printmaker Dirck Volketsz. Coonhert in Xanten, Germany, and three years later followed his master to Haarlem in the Netherlands. In 1579, aged 21, he married the wealthy widow Margartha Jansdr., enabling him to set up his own printing house. The pair remained childless, but his wife’s son from a previous marriage, Jacob Matham, later became his apprentice and business partner. Goltzius’ Mannerist engravings, characterized by complex, dynamic compositions and figures with exaggerated physiques, earned him international acclaim, and his patrons soon included royalty from all parts of Europe. 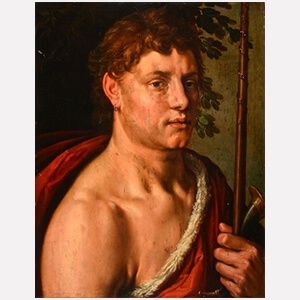 After visiting Italy in 1590/91, where he studied the works by Raphael, Michelangelo and Caravaggio, Goltzius abandoned Mannerism and adopted a more naturalistic, classical style. By 1600, aged 42, he gave up printmaking for oil painting – a new challenge, which he also regarded as the superior, more prestigious art form. 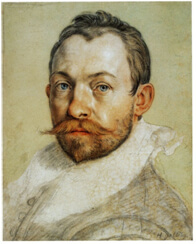 In 1612 Goltzius made the acquaintance of Peter Paul Rubens, who had an important impact on his painting style.He died on New Years’ day of 1617 in Haarlem. 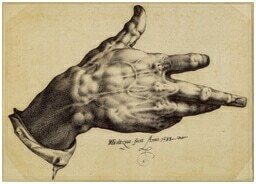 Goltzius’ oeuvre includes about 160 prints and print series, around 500 drawings and about 50 paintings.